To place an order for contact lenses and prescription glasses or sunglasses, you will need to have a valid prescription by getting your eyes checked from your eye doctor, optometrist or eye care professionals. The prescription contains the precise measurements of your eyesight (also known as power) to have the clearest and most comfortable vision for you. How to read your prescription? Some eye doctor indicate the right or left eye by this term. OD stands for the right eye, while OS stands for the left eye. A plus sign (+) in the box indicates that you are longsighted, while a minus sign (–) shows that you find it hard to see things that are far away without glasses. The number might be very small, like 0.25, or a large number, like 6.00. The higher the number, the stronger your prescription (power) it is. This can influence your choice of lens for your frame. The higher the prescription, you will need a thinner lenses (higher index) for your frame. The amount of astigmatism (visual distortion) that is caused by an irregularly shaped cornea. This box may comes empty, so if it’s empty it means that you do not have astigmatism on your eyes. The direction of the astigmatism, measured in degrees. The number is not related to how well you can see but it helps us to know what angle to position your lenses in the frame. If you are over 40, there may be a number where it says ‘ADD’. This is your reading addition and relates to the amount of additional correction needed to focus at close distances. If you are getting yourself a pair of reading glasses from us, this is an important information. This tells us the distance between the pupils of your right and left eye. And you will only need to key in this information if you are placing an order for prescription glasses. In case there is no PD on your prescription, you can ask your local optician to check it for you, though you may need to pay a small fee. How do you let us know your prescription? 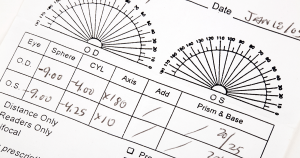 When you place an order for contact lenses or prescription glasses, there will be a form for you to fill. Just simply type it in according to the parameters. Otherwise, if you are not so sure how to type in or read your prescription, please email us at customerservice@lensmart.com.sg and our friendly customer service team will assist you further.